Back in August 2004 while trying to find a safe alternative to making G-ORME I had managed to produce 2 samples of large gold clusters that apparently had the capacity to respond to a strong magnet. Ever since I had chanced upon these results I have maintained a container of fine gold fallout that tends to equal about 10mg for every large batch of colloidal gold as the result of small thermal difference between the water temperature and the electrode hardware. As I did not have safe facilities to store or use the strong acids that are prescribed for most G-ORME methods I opted to find another way that entails the use of commonly available chemicals and materials that are generally safe to use in the non-lab environment. 1. Colloidal Gold -heck, I have bunches of it, and the gold is in such fine particles I just have to find a way to use this in helping produce a G-ORME. 2. Hydrogen Peroxide – It is very available and quite powerful yet safe enough once the hazards are understood. 3. NaCl – Table salt, cheap, available basically safe right? 5. Vinegar – This is a mild acid, cheap, available and possibly useful. Ok, enough introduction… on with the interesting stuff! This first video shows the response to a magnetic field by a gold particulate in a few drops of water, on a glass slide as it is moved over a set of 4 small round (rather strong) neodymium magnets. As you can see, the reaction to a magnetic field is not typical of gold. To further illustrate this property of magnetic response I offer the same sample after it is dried and sealed in a 4mm glass tube then acted upon by a long stack of round neodymium magnets. This gold powder was the product of my first sample. Considering that the first sample was the product of regular experiments into gold digestion and alternate g-orme production I failed to document the steps that led up to the results other than the crude form of dried salt crystals prior to heat treating. Even though I have spent many hours chipping away at this application over the past year or so I feel it is important to point out that I am nearly clueless as to why this simple process that I am about to detail for you can cause the effects that are being demonstrated. I am certain that we all have theory as to why… as do I myself however the question still remains. 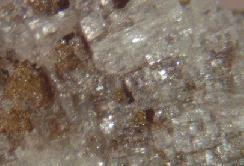 What would cause this specific type of magnetic response to effect mere gold particulate? This is the first documentation of this process and it is by no means complete in any way. This is just the beginning of what I feel is a break point that helps to define future experimentation towards a better understanding and hopefully a more refined method and product under the heading ‘Novel forms of G-ORME using common household grade chemicals and wares’. Specifically colloidal gold that has no additives other than say hydrogen peroxide. What we want is a pure gold form in water that isn’t already bound in a molecular state to some other element or compound. Blue, Black, Purple, Orange, Red, it is all the same as far as this fundamental experiment has been defined. I have been using waste batches of colloidal gold for some time for use in these experiments as the next step makes the quality of the colloidal gold rather moot. All of that pretty colloidal gold get put in a large container and shocked with 1 of 2 methods. A. Add salt water and wait 12 hours for it to settle. B. Heat up the colloidal gold and pour in a few ounces of very cold water. This gives instant results. The original size of the gold particles is not changed simply do to forced agglomeration. The objective is to end the colloidal state and remove the excess water after the gold falls to the bottom of the container. Place the gold fallout into a small 250ml beaker and add a tablespoon of salt, tablespoon of vinegar and about the same measure of 35% Hydrogen Peroxide. You may want a larger beaker, and by beaker I am saying you should use a pyrex vessel for this part of the process. The hydrogen peroxide is going to react with the gold and what is now a very weak hydrochloric acid ( so I have read ) and even before you heat this mixture it is possible for a fairly aggressive reaction to take place. Expect ‘Heat’ and ‘Foaming reaction that may exceed the volume of your container’ ! The next part of this step is to add heat to your mixture of Hydrogen Peroxide, Vinegar, Salt and Gold Fallout. Add heat until you are somewhere close to the boiling point. You do this once and most likely do not have to add more heat. It is otherwise advisable to set your mixture vessel on a surface that is resistant to heat and chemical damage. For about 2 minutes you should find the mixture foaming and generating its own heat. After 2 minutes it should have settled down a bit and the result (easier to see under bright light) is a nice reddish gold dust on the bottom of your beaker. Let that settle and remove the excess water with large volume dropper or any means at your disposal. I then use a large pyrex glass evaporation disk and dry out the solids. Make sure you scrape all the salt, gold that dries out together. Do not discard any apparent salt that accumulates, we need that for our next step. 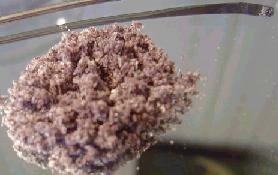 The results should be a course purple salt that is rather uneven and granular. Using a flat smooth surface, utility type razor blade you can chop the granules into small pieces. It may also be useful to use a glass tube or some type of roller to flatten the crystals before you chop them to a fine powder. I also use a mortar and pestle to finish this refine step as it is important I felt to mix the separated salt from our evaporation and the uneven gold/salt distribution by grinding the dried product into a fine powder. The fine powder product may not be a required step. In my first run of this process I didn’t bother to refine my powder and I felt that it may be better to have the best mix of gold and salt prior to heat treatment to keep the gold particles from melting into little nodules. We want to keep the gold particles as small as we can for reasons that may become clear in the next few steps. 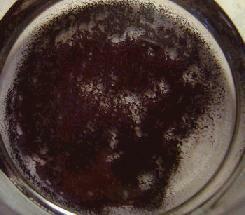 BTW- It doesn’t hurt to scan the current purple powder with a strong magnet just to see if some might stick. I use a very thin piece of wax paper to cover the magnet as it can be difficult to remove the little particles otherwise. What I found was that a very small percentage (estimated 8%) of this dried purple gold/salt stuff could be removed using a magnet. Fancy that! I use a small platinum crucible however stainless steel ramekins would serve well and can be purchased in kitchen wares for a reasonable price. And this is what I ended up with after the heat treatment. Drop the heat treatment vessel into a small container and add water or add water to your heat treatment vessel if it is large enough. Heat the water and stir until you have dissolved any of the heat treated gold/salt. What you should have now is a nice orange liquid. Ok, Same deal as step #4. Aside from drying out the liquid you may want to remove the salt by washing the end product. I opted not to waste too much time on washing, instead I saved my wash water and claimed what would fall out over a reasonable amount of time. My second run at this process as described here resulted in a less potent (or apparently less potent) product. This could be some slight variation in the process between batch 1 and 2, or it could be as simple as the finer powder product in run 2 combined with the salt makes the powder sticky and less responsive to the magnetic test. The best results I have documented are presented in the videos on ‘page 1’. The wash water issue boils down to this. I have dried samples of the wash water suspecting that there are much finer particles of gold that are still floating around and I have the most interesting results. It may not be obvious at first glance but these are 3 and 4 sides pyramid shapes. Look closely and you can see that these are in fact pyramids with height and not just flat squares and triangles. 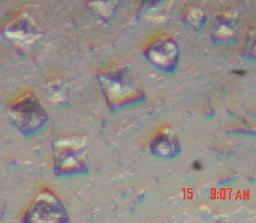 The diatomic nature of the crystals is in stark contrast to normal NaCl, table salt. Table salt has an inverted pyramid structure that when fully grown ends up the very familiar salt crystals that are little cubes. Apparently the gold is interlaced with the salt in such a way as to effect the crystal lattice structure. This is what I have to share at this time as I feel it is just the beginning for greater developments in this field of endeavor. (What has intent got to do with it?). I have had the opportunity to test contrasting energy from people and the results (as scientific as such things can be) I can now publish for whatever interest it is worth. What do you do with a bottle of colloidal gold that you know has a tendency to absorb the energy of the person who comes in contact with it? I though ‘hey’ what an excellent chance to see how the energy would effect the gold. The perfect experiment would be to see if I could reduce this colloidal gold and process it according to the previous examples in ‘orme’ (though I realize that the label may need further clarifications) and see what there is to see. 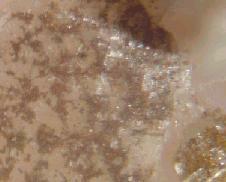 So I reduced the gold into a fine particulate same as I have in the previous examples. As you can see. Nothing unusual at this point. 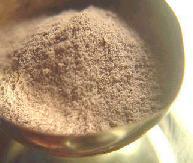 My colloidal gold fallout was much the same as before in the dried form before annealing. Here you can see the salt after anneal however as the red glow faded we begin to see that something is not as it is supposed to be. Notice how the gold and the salts separated during the anneal? I should mention now that the pre-annealed sample was dragged with a magnet to check for a percentage of gold that would react with a magnet and there was effectively 0% material that responded to the magnet. The end product after the anneal (when turned into a powder) had absolutely no magnetic response either. 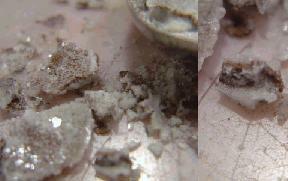 What I did was photograph the various stages of break down (rather than drop the entire sample into a liquid after anneal) so that we could investigate the separation of the various components. Notice how the salt surrounds the gold on the top and bottom. I find it interesting that the gold though heavier than the salts would tend to maintain a density between a lower and upper layer of the hot liquid salt during the anneal. 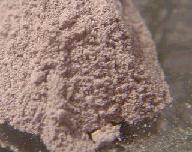 The fine powdered results look like salt with pepper contamination. The gold apparently decided to gather and fuse in large particles while leaving the salt base during the heat treatment. Is this then the result of negative energy imprinting on the gold prior to this experiment? Compare the two samples after the heat treatment. The test that allowed gold to become magnetically responsive. 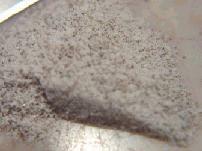 The current sample treated with negative personal energy. The same process. Two results. Love on the left, Hate on the right. You decide what it is worth. All content and photos copyright (c) 2005,2006,2007 Karl Reinhart of The Shekinahguild.